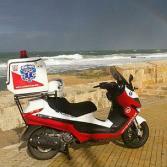 United Hatzalah's ambucycle fleet enables the organization's volunteers to get to medical emergencies within the first critical minutes. These are the minutes when hearts can still be restarted, when serious bleeds have to be staunched, when suffocating children have to be attended to. We are raising funds for a Rough Terrain Ambucycle for United Hatzalah that will not only be able to navigate narrow alleyways in the city but also do long distance rides to get to highway accidents and even negotiate difficult terrain. The magic of ambucycles lies in their swiftness and small size. A traffic jam - either in the city or on a highway - does slow an ambulance down significantly, while the ambucycle drives right through it getting to the person in need of medical attention within minutes. One ambucycle makes a lifesaving difference. The medic using it will attend to hundreds of emergencies a year and in 25% of the cases his early arrival will mean the difference between life and death for the victim. For real life stories on how ambucycles save lives please visit http://israelrescue.org/blog/. Great job! Thanks for making a difference! I'm grateful and glad to make a donation. What is being done is a blessing.